What's The Best Business Model For Nanowire LEDs? Should developers of nanowire LEDs seek success with devices sporting diminished droop? Or should they try undercutting the cost of incumbent chips? There are two well-trodden paths for winning market share: Make your product better than what is out there, or make it cheaper. Both options are on the table for developers of nanowire LEDs, which are devices that are based on the growth of long, cylindrical structures from out of the plane of a substrate. The novel architecture of this device could aid the growth of indium-rich, high-quality active regions, making it easier to fabricate green-emitting LEDs; and the design can allow a trimming of the current density through the structure, leading to a reduction in droop, which is the decline in efficiency as the current through the chip is cranked up. Alternatively, nanowire LEDs could lead to plummeting production costs, if the design can slash the amount of epitaxial material required to make a device. Today, nanowire LEDs are in their infancy, so it is not yet clear whether they can displace the traditional planar LED through superior performance, lower cost, or a combination of the two. Evaluating the potential for superior performance forms part of the activities of European projects involving one of the world's leading chipmakers, Osram, while French start-up Aledia is pursuing the opportunity for driving down device costs. To drive down costs "“ it is claimed that Aledia's LEDs have the potential to be produced for just a quarter of that of incumbents "“ the company is pursuing a radically different design. But to understand why it is revolutionary, one must first understand what the more common approach is. Nanowire LEDs and their variants have a markedly different architecture from conventional, planar devices. Osram is core-shell microrod LEDs, which are larger than their nanowire cousins, and open up the opportunity to pack phosphor between the light emitting structures. The radical route of Aledia is to dispense with the buffer. This approach is clearly more risky, but if it comes off, the company not only saves money by eliminating the buffer, but also benefits from far greater freedom over the choice of the substrate. Large area silicon is currently the preferred choice, due to its low cost and the availability of sophisticated, highly capable processing equipment for this type of wafer. Merits of the silicon foundation extend beyond low cost manufacturing. Constructing LEDs on this foundation will also help to usher in an era of smart lighting, which could be underpinned with chips featuring three-dimensional stacking technologies. Aledia's nanowire LEDs originated in the labs of scientists at the research institute CEA-Leti. Two of the founders "“ COO Xavier Hugon and CTO Philippe Gilet "“ came from there, with Anania coming on board when the pair tried to raise investment to form a company to commercialise the device. An example of nanowires fabricated by Osram and its partners. Side-view of microrods (blue) on a GaN template (grey) embedded in a micrograin phosphor and silicone matrix (yellow). Progress has been underpinned by â‚¬12 million of funding, which has enabled an increase in the workforce "“ there are now around 50 people working for the company, including some who are contracted from CEA-Leti. With development of nanowire LEDs accelerating and performance improving, 58 patents have been filed to detail and protect the innovation. of nanowires is far more challenging than that of their planar cousins. "In 3D it's horrendously difficult. So many things cannot be measured "“ they need to be measured indirectly," explains Anania. Angled scanning electron image of microrods produced by Osram and its partners. The microrods have a height of 40 mm at a diameter of ~900 nm and feature side facets that form a surface 15 times larger than that of the substrate they are standing on. 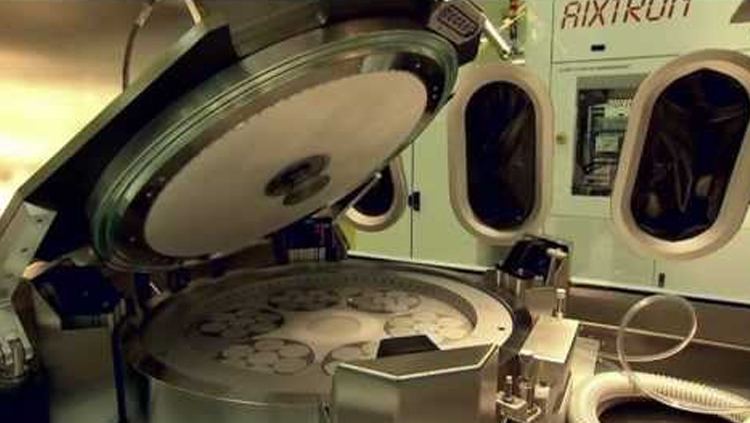 Development of the company's products takes place on 8-inch wafers. This is significantly more costly than using far smaller wafers, but the key benefit is that it removes the need to scale up the process for production. "I don't believe the guys who say that they are on 2-inch, and when they get it to work, they'll move it up to 8-inch," remarks Anania, arguing that processes always need to be changed when introducing larger wafers. After the company has fully mastered its growth of nanowire LEDs, it will carry out this manufacturing step in-house. Wafers will then be shipped to foundries for processing, before the chips are sent on to high-volume packaging houses. "These are not partners, these are sub-contractors," asserts Anania, adding that the final products will be LEDs and modules. Anania is rather reluctant to discuss the possible performance of Aledia's first generation products, which might be shipped in small quantities for customer evaluation in 2015. However, he is convinced that the performance of his company's devices will steadily close the gap with their conventional cousins, rather than forever playing catch-up. The basis for this argument is that the incumbents have hit a plateau. "The leaders have made the hero samples at 200 lumens per watt, but there is no encore possible," says Anania, pointing out that although many of the Chinese LED chipmakers are well off the pace today, they will catch up to create a commodity market. Price is then the major differentiator, playing into the hands of Aledia. The ultimate application is solid-state lighting. Anania believes that the company will ultimately crack this market, because the efficacy of its nanowire LEDs can climb to hundreds of lumens per Watt. Thanks to growth of material on the m-plane, these devices are not plagued by the internal electric fields that hamper the output of their conventional cousins, so they should be able to outperform them. In part of the project SMASH "“ smart nanostructured semiconductors for energy-saving light solutions "“ scientists evaluated the merits of nanowire LEDs in more detail. Martin Strassburg, a partner in the project who works for Osram Opto Semiconductors, told Compound Semiconductor that the internal quantum efficiency for nanowires is typically 65 percent, compared to 85 percent for conventional c-plane LEDs. This shortfall is a major impediment to a high output power: The lack of an internal electric field within the device means that there is a relatively small difference in wavelength between absorption and emission, allowing reabsorption to contribute to losses from the active region. In order to form devices with a high external quantum efficiency, internal quantum efficiency must reach the realms of 80 percent. One advantage of the "˜core-shell' nanowire LED, according to Strassburg, is that it can suffer from far less droop than its conventional cousins: "Due to the increase in active area, we can reduce the effective current density by a factor of ten. You are then able to operate the blue LED at its maximum internal quantum efficiency. " With green LEDs, droop is more pronounced, so this type of nanowire can only operate nearer its maximum, but this still leads to a substantial increase in light output at reasonable drive currents. An array of core-shell microrods emitting blue light under resonant excitation with an ultraviolet light source. The bright spot in the centre is an artifact due to blooming effects. Those working in the SMASH project hoped that nanowires could trim defect densities in LEDs, thanks to strain relief. Although this happened in some areas of the device, next to them were regions with higher defect densities. "We ended up more or less abandoning this part of development, because the grain sizes were much smaller than the chip size would be. But it was good to know that this was a dead end, and should not be pursued further," reflects Strassburg. Researchers in the SMASH project also explored the development of quantum disc nanowire LEDs, which have the layers of the structure separated vertically along the protruding wire. Such a structure could, in theory, be formed by growing a conventional LED and then etching away material from the top to form wires. Obviously, however, it is better to employ a "˜bottom-up' approach: This cuts material costs and can lead to longer-wavelength devices, because more indium can be incorporated into the active region without impairing crystal quality. Encouragingly, the internal quantum efficiency of MBE-grown, green-emitting nanowires sporting this disc architecture exceeds that of their planar cousins. However, these results cannot be replicated when this class of nanowire is grown by MOCVD, the preferred technology for high-volume LED manufacture. Due to this issue, Osram is not currently pursuing this disc-in-a-nanowire architecture. One area where Osram is active is in the development of LEDs that share some hallmarks of the nanowire devices, but are a bit bigger. Referred to as microrod LEDs, these structures are 10-20 mm high, have a diameter of around 1 mm, and are spaced apart by between 2 mm and 5 mm. Single core-shell microrod lying on its side and emitting blue light under resonant excitation with an ultraviolet light source. Because of wave-guiding effects, the ends appear brighter that the side facets. Placing the phosphor up against the microrods leads to a hike in performance, according to Strassburg, who explains that m-plane emission is easily extracted to the side facets, where it cannot be re-absorbed, but goes directly into the phosphor. Here the light is converted and cannot be reabsorbed by the microrods, thus trimming the losses associated with the LED. What's more, thanks to being closer to the chip, the phosphor temperature is probably about 20 Â°C lower than if it were remote, enabling the LED to operate at a higher efficiency for more hours. Osram is looking at this, partly through a project entitled GECCO that involves partners from Germany, Spain, Poland and the UK. As they make progress, and Aledia refines its nanowire LEDs for commercial launch, it will be interesting to see if reports of nanowire LED development appear from other leading chipmakers âˆ' and further ahead, what emerges as the best business model for the nanowire LED. -Compound Semiconductor contacted LED nanowire developer Glo during the preparation of this article. Glo declined the opportunity to be interviewed. Recently, GaN LEDs grown on large silicon substrates have hit the headlines as a route for cutting chips costs. Anania, however, does not expect this form of LED to take the industry by storm: "Two or three years ago, there was the belief that you could really lower the costs by doing that. I think that's gone away." Anania argues that while the likes of Osram have developed the technology, they are not using it for high-volume chip production because the savings aren't big enough. "The performance is less good, the yield is less good, the MOCVD time is doubled and the amount of GaN you need is twice as much." According to Anania, the cost saving is only about 25 percent when switching to a silicon platform, so whether this is worthwhile depends on the existing infrastructure of the company: "If you happen to be Samsung and you have empty 8-inch fabs, then it makes sense, because it is not going to cost you anything to do it. If you are Osram and you don't have any 8-inch fabs, you've got 6-inch sapphire and it's pretty good stuff, the cost-delta isn't that big."